Have you ever wondered when first Glass Christmas ornaments were invented? History sends us back to….16th century! It all started in Germany that time. There is a legend that the tradition of decorating the Christmas tree spread across the world from Germany. German theologian Martin Luther was first one who initiated this custom. On Christmas Eve he was returning home along the forest path, and looked on the night sky. Luther admired the beauty of the stars, thickly studded firmament, and it seemed to him that crowns of tall pines and spruces sparkled with stars too… To recapture the scene for his family, when he got home, he erected a Christmas tree in a tub and wired its branches with lighted candles. That time people in Central Europe also decorated Christmas trees: families put on the table a small beech tree, dressed up with cooked honey apples, plums and nuts. Glass Christmas Ornaments history started in Lauscha, Germany, small village in the province of Thueringen. Lauscha is still well-known for its glassblowing, especially for Christmas tree decorations like baubles. Christoph Muller and Hans Greiner set up Germany’s first glassworks in 1597. The Christmas tree bauble, which is most popular Christmas ornament decoration, came into mass production since 1847. Baubles nowadays have various designes and patters. In 1847 Hans Greiner (a descendent of the Hans Greiner who had established Lauscha’s first glass works) began producing glass ornaments (Glasschmuck) in the shape of fruits and nuts. These Glaskugeln were made in a unique hand-blown process combined with molds (formgeblasener Christbaumschmuck). Highly skilled artisans heated a glass tube over a flame, then inserted the tube into a clay mold, blowing the heated glass to expand into the shape of the mold. After the glass cooled, a silver nitrate solution was swirled into it, a silvering technique developed in the 1850s by Justus von Liebig. After the nitrate solution dried, the ornament was hand-painted and topped with a cap and hook. The ornaments were blown and silvered in a workshop attached to a home. All members of the family, including children, helped to paint and finish them. A typical work day lasted 15-16 hours, six days a week. At this pace, a family might produce 300-600 glass balls a week, depending on size and complexity. Soon these unique glass Christmas ornaments were exported to other parts of Europe. By the 1870s, Lauscha was exporting its unique glass ornaments to Great Britain. In the 1880s, German glass Christmas ornaments were first imported to USA by American entrepreneur F. W. Woolworth , who discovered Lauscha’s baubles during his visit to Germany. This Christmas ornaments tradition is carried on till nowadays. 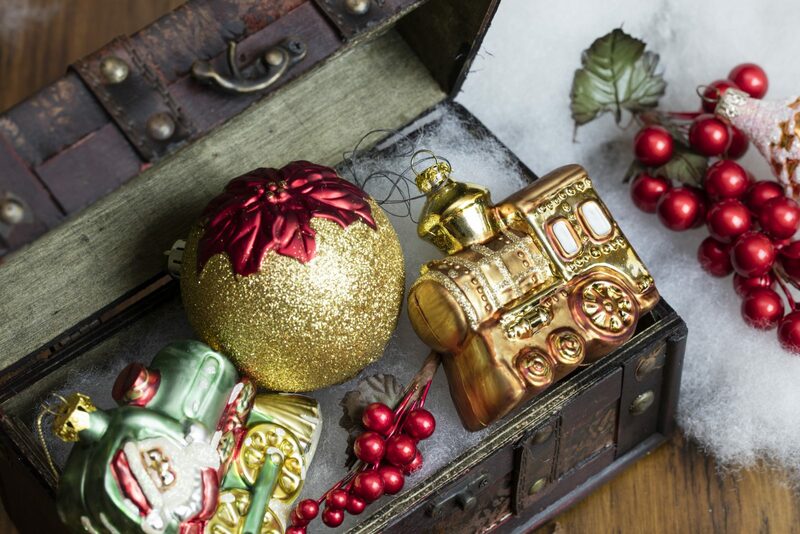 Today you can find vintage Christmas ornaments and collectibles from old times, or you can choose new ones… They will be also beatiful, because traditions for making these unique Christmas ornaments are still in place! This entry was posted in history of christmas ornaments and tagged christmas balls, christmas figurines, glass christmas ornaments. See you in Seasons Christmas Show, November 18-20!